UPDATE: This event is SOLD OUT. You may still put in reservations for the waiting list and we will contact you if a spot opens up. On Saturday, February 1st, we will be hosting a gourmet four course beer dinner featuring the talent of Chef Daniel Miles and fresh craft beer from Third Street Brewhouse of Cold Spring, Minnesota. Chef Daniel Miles from Minneapolis has crafted a special menu just for this event and he will join us to prepare the dinner and to present each food course. Daniel graduated with honors from Le Cordon Bleu College of Culinary Arts. Chef Daniel has worked in the kitchens of some of the Twin Cities best Chefs, most notably James Beard Award Winner Tim Mckee at Solera, La Belle Vie, and Sea Change. Dan worked his way up through the ranks to an Executive Chef position at Level 5 Cafe, at the Guthrie Theater in downtown Minneapolis. His areas of focus have included French and Spanish cuisine, as well as Sustainable Seafood. 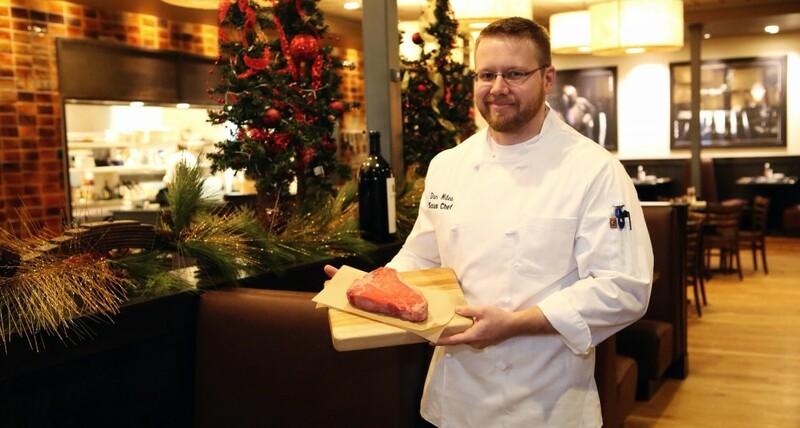 He is currently plying his trade at Pittsburgh Blue in Edina, Minnesota where steak and seafood takes center stage. The beers from Third Street Brewhouse have become a staple for craft beer lovers in central Minnesota and the Twin Cities. In their rapid rise to popularity the word is getting out and now you can find their amazing brews throughout North Dakota as well. Mike Illig from Third Street will join us to present each of the four beers on the menu. Mike will explain the ingredients and flavors in the beers as well as the food pairings for each course. This will also be a fun opportunity to hear about how this successful local company makes their delicious craft beers. Questions are welcomed. Third Street offers four year round beers and three seasonal beers. 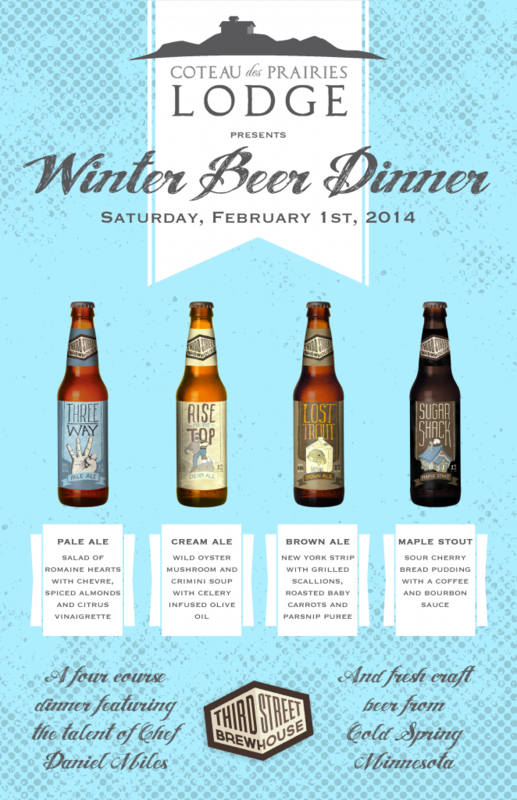 Our beer dinner will feature three of their regulars as well as one of their seasonal brews, Sugar Shack. The event is on Saturday, February 1st at Coteau des Prairies Lodge. Everyone is welcome, but space is limited and meals are available by reservation only. Alcohol will be served only to those over 21 years of age. The price is $40 per person. The meal includes a gourmet four course meal and 6 oz. of beer served with each course. Water and coffee will be provided. Sodas and additional alcoholic beverages will be sold at the bar. Doors open at 4pm, guests are welcome to come early, tour the lodge and enjoy refreshments served at the bar. When you arrive at the lodge, sign your party in with our hostess. Guests will be seated for the meal promptly at 6pm.